Home Facebook Netizens Surname wars Trending Viral Photos FEU Surname Wars: Netizens Make fun of their Surnames and It will Surely Make You Laugh! 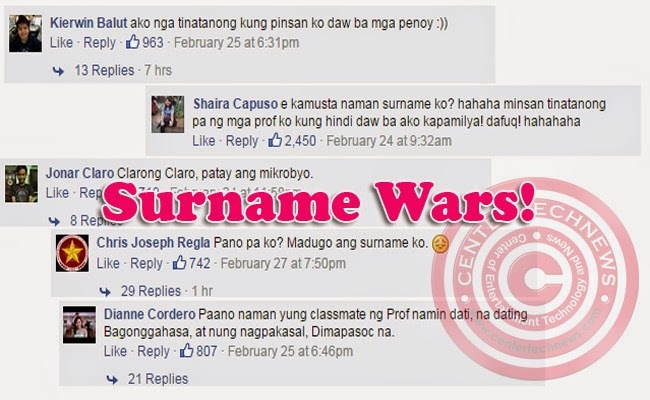 FEU Surname Wars: Netizens Make fun of their Surnames and It will Surely Make You Laugh! Surname wars had been taking the net by storm all thanks to a young lady who posted her dislike for her family name. On February 24, a student from Far Eastern University had posted her simple rant in FEU Secret Files, a page where students of the said university can freely post their confessions. In the said rant, she said that she hated being called in her surname ‘Beech’ as what people usually do campuses and schools. Apparently, her surname does sound like a cruel word usually used for women and hearing her surname in the public makes people think of her as a rude person. The post had been shared more than 2,500 times and received more than 12 thousand likes in less than a week. Her simple post of her melancholic dilemma was taken as an opportunity by many Filipinos to make fun of their own surnames, making others realize that they are not alone in such situations. Leighton Daguro tagged his name as ‘The teacher’, while Jed Tavu had received more than 3,000 likes after posting that people were always looking for ‘timba’. The posts went on and on making fun of their names. Surnames had been created by Spanish during their invasion to easily keep track of the Filipino’s genealogy and taxes. As to why such surnames emerged goes back way far in the history. As of now, instead of feeling bad, Filipinos had shown their usual enthusiasm over a matter that might seemed a reason of rant for others.